It’s been another award-winning week for the unstoppable Gill Prescott. On Thursday 5th December she won the Northern Echo Local Heroes Award for Outstanding Performance of the Year, after winning the Durham Regional Award. Two days later, she followed this with a Championship Record breaking performance at the British Indoor Rowing Championships in Cardiff on the 7thDecember. Gill’s time of 7.23.3 smashed the existing 55-59 age record by 5 seconds and was only 2 seconds slower than her own world record. Also joining Gill on the winner’s podium that day was erging supremo Roger Stainforth, in the 65-69 group, with a winning time of 7.13. On receiving the award for Outstanding Performance, Gill said “It is lovely to receive this recognition however I am just doing something I really enjoy! !… Geoff, as ever, also deserves the recognition as a first class coach”. So, well done again to Gill, Geoff and Roger for representing Durham so well at all of their events and continuing thanks to Roger for sharing his erg tips with the Recreational Rowers on Monday mornings. Maybe we’ll see some more entries in the older age groups next year? What a great end to 2013.. This entry was posted in Club News, News on December 14, 2013 by Jacki Patrickson. Not content with breaking world records and winning over 30 events this year, Gill Prescott is now through to the finals of the Northern Echo Local Heroes Awards 2013. Gill won the Sporting Achievement of the Year Award at the County Durham Sports Awards in October and has now been shortlisted for the Award for Outstanding Performance in the regional awards, which will be announced on 5th December. We’re all aware of how phenomenal Gill is, but it is great to see her achievements being recognised by a broader audience across the North East. It’s also a great acknowledgement of the time and expertise that Geoff Graham, Gill’s Coach has provided to her training over the 7 years that Gill has been competing. On being nominated Gill said “It is lovely to receive this recognition however I am just doing something I really enjoy! !… but I hope it will give the sport and the club some good publicity and Geoff the recognition he deserves as a first class coach”. Winning the British Indoor Rowing Championships for the seventh time. She has been an inspiration for rowers across the club and is a target for many of those DARC members discovering rowing later in life. If only we could achieve half of her commitment! Geoff and Gill’s dedication to the sport has motivated others to aim for and achieve success at all levels of competition and they continue to set the standard for focus and strength in training for us all. This entry was posted in Club News, News on December 1, 2013 by Jacki Patrickson. Durham rowing Olympian, Jess Eddie, visited the club on the 6th October to launch our newest racing boat, the “Jessica Eddie”, a lightweight Eight named in her honour. 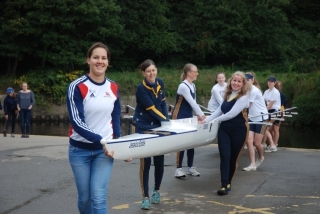 Jess, who attended St.Leonard’s School in Durham and learned to row on the River Wear at age 8, joined Durham ARC as a teenager before being picked for the GB squad when she was just 16. 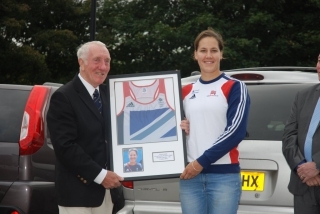 She has since rowed for Great Britain as a Junior, Under 23 and Senior rower, competing in the GB womens’ 8 in both the 2008 and 2012 Olympics. She most recently finished 4th in the 2013 World Championship. 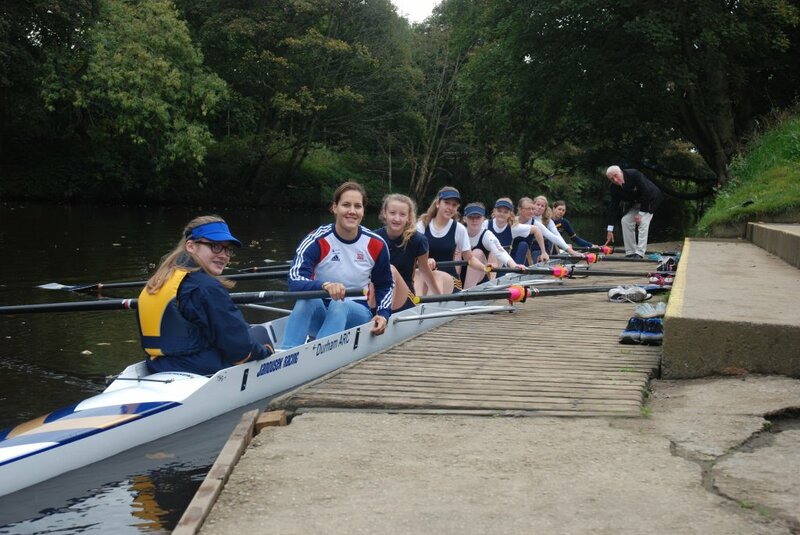 During the morning she spent an hour coaching our Junior squad and then took the boat for its first spin with a combined crew of lucky women and juniors. Jess took the stroke seat and joked that she “normally sits at Bow side, but would make an exception in this case”. Clive was heard to murmur approval at her long stroke and slow slide before the crew returned to the landing to carry on with the interviews and photographs. Before the ceremony, Jess took the opportunity to present the club with a framed shirt that she wore when racing in the 2012 Olympics. There were questions from the crowd as to whether it had been washed, and Jess’s mum confirmed that it had. The launch was also attended by the Deputy Mayor of Durham, Councillor Jan Blakey who also expressed an interest in coming down and trying out the boat. Committee take note to follow up! The “Jessica Eddie”, is the result of a lot of hard work in fund raising by many members in the club over the past year. Many, many thanks to all of them, we hope they now get to fully enjoy the rowing fruit of their labours. Throughout the morning, Jess was a fantastic role model for rowing, providing excellent coaching, pitching in with carrying boats, talking to all members of the club and fitting in the press too. We all wish her every success in the coming years and hope she gets back to full fitness soon. The launch was featured on Tyne Tees, the Northern Echo, Durham Advertiser and Durham Times as well as making the headlines on the British Rowing website. This entry was posted in Club News, News on October 19, 2013 by Jacki Patrickson.